The hollowness of the PM washing the feet of sanitation workers cannot be starker, as data shows one such death every five days. 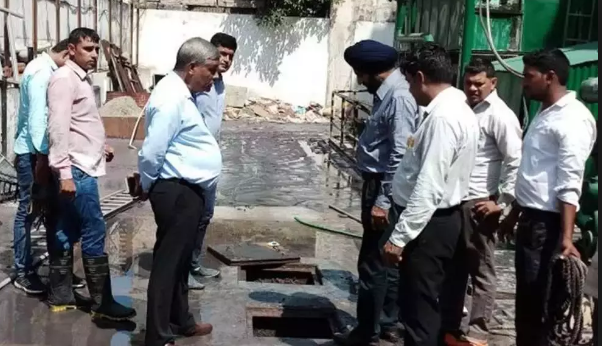 New Delhi: Two workers died after they inhaled toxic fumes while cleaning a septic tank at an automobile company at Narsingpur in Haryana’s Gurugram on Sunday. The deceased have been identified as Aslam (33) and Shiv Kumar (35), who were contractual workers. As per The Hindu, eyewitnesses said Kumar first went down the septic tank at Sunbeam Auto Private Limited company around 4.30 p.m. and returned safely after he got tired. After this, Aslam went down but fell unconscious upon inhaling toxic fumes. When Aslam did not return, Kumar went into the tank and met the same fate. The two were later rescued by fellow workers and taken to Kathuria Hospital where doctors declared them dead. Inqlabi Mazdoor Kendra (Central Committee Member) Shyambir Shukla said despite deaths during cleaning of sewers and septic tanks being routinely reported in Delhi and the National Capital Region, the workers were not given safety gears. The Times of India said that the union members had staged a protest on Sunday after deaths and also submitted a letter to the management. This is not the first incident of septic tank deaths to have occurred in the city. In 2017, three workers had died while cleaning a sewage line in Khandsa. Five men had died after entering a sewage treatment plant in Moti Nagar, Delhi, and three more had lost their lives in neighbouring Ghaziabad after having inhaled toxic fumes in a water tank in July last year. In yet another instance reported from Chhattisgarh, five people suffocated to death inside a septic tank in the Jashpur district in 2018. The gross under-representation of these deaths became clear with the data compiled by The Indian Express following the sanitation workers deaths in 2018. The data suggested that the frequency of such incidents was one manual scavenging death in every five days. Under the Prohibition of Employment as Manual Scavengers and their Rehabilitation Act, an amendment to the law in 2003 brought cleaning of septic and sewage tanks under its purview. Section 7 of the law prohibits local authorities or agencies from employing a worker to clean sewers and septic tank. Despite these provisions, the situation on the ground remains dire. Newsclick had previously reported on problems with the collation of this data, when the Delhi government had found only 32 manual scavengers in its survey in August 2018. In an attempt in June 2018, it was reported that more than 53,000 manual scavengers are employed in 12 states, including Uttar Pradesh, Maharashtra, Rajasthan and Haryana. The series of deaths do not seem to stop, owing to the brazen flouting of basic safety norms as well as widespread exploitation of workers. It is mandatory for all workers involved in dangerous jobs such as these to be provided with safety gear like gloves, masks, etc. According to Indian Express, the police is still determining if these were provided to them. Ever since the Lok Sabha elections were announced, several civil society groups, including manual scavengers, have come up with their own manifestos, hoping they will finally be heard. Calling for declaring India as a country independent of manual scavenging, the manifesto demands liberation from manual scavenging, rehabilitation of manual scavengers with dignified with non-scavenging employment and livelihood options and insists on Safai Karamchari’s life to health, education and dignity.